It's been a while since I did a news post but I've had quite a few exciting emails over the last couple of weeks so I thought I'd do a roundup post and share it all with you. You've probably already seen at least some of this on other blogs but hopefully there will be something new here for you to discover. First I want to share the cover for Pandemonium by Lauren Oliver. Pandemonium is the second book in Lauren's Delirium series and will be released in the UK on the 1st of March by Hodder & Stoughton. I absolutely loved Delirium (read my review here) so I can't wait to read this one and I love the cover. New York, NY/ London (January 5, 2012)—HarperCollins Publishers announced today that it has preempted rights to a three-book middle-grade series, House of Secrets by iconic Hollywood director and producer Chris Columbus, co-authored by acclaimed young adult novelist Ned Vizzini. This is Columbus’s debut series for young readers with the first book slated for global publication in Spring 2013. The three-book North American deal was negotiated by Alessandra Balzer, Co-Publisher of the Balzer + Bray imprint at HarperCollins Children’s Books, with Dorian Karchmar at William Morris Endeavor. UK & Commonwealth rights were acquired by Rachel Denwood, Publishing Director from Cathryn Summerhayes at William Morris Endeavour. Rights have been sold in twelve foreign territories so far. “Master storytellers Chris Columbus and Ned Vizzini have created a high-stakes fantasy,” said Balzer. “From the very first page I knew we had to publish this series. It’s an incredibly imaginative adventure with clever plot twists and nonstop action—not to mention a family that readers will immediately fall in love with. House of Secrets has all the hallmarks of a new classic." The Pagett kids had it all: loving parents, a big house in San Francisco, all the latest video games . . . But everything changed when their father lost his job as a result of an inexplicable transgression. Now the family is moving into Kristoff House, a mysterious place built nearly a century earlier by a troubled fantasy writer with a penchant for the occult. Suddenly the siblings find themselves launched on an epic journey into a mash-up world born of Kristoff's dangerous imagination, to retrieve a dark book of untold power, uncover the Pagett family's secret history and save their parents . . . and maybe even the world. On the 1st of May HarperCollins will be publishing the much anticipated sequel to Divergent by Veronica Roth. 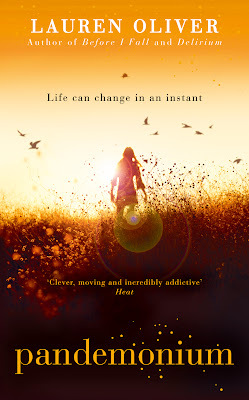 Divergent was one of my favourite reads of 2011 (read my review here) so I can't wait to get my hands on Insurgent! I absolutely love the Insurgent cover and I have to say I much prefer the new paperback cover for Divergent than the hardback one. Do you know who Candy Gourley’s favourite monsters are? Which famous author John Dickinson failed to recognise at a book launch? SF Said’s favourite hobby? The DFB Storyblog is just that – a blog full of STORIES, written by David Fickling Books’ authors and illustrators! Every week, a range of DFB creators take it in turns to share their experiences and discuss a topic which coincides with the publication of a new DFB title. For example, the recent topic ‘Retelling Classic Stories’ celebrated Kenneth Oppel’s This Dark Endeavour, which tells the story of young Victor Frankenstein. The current topic unveils influence and research behind the authors' work - Linda Newbery, author of Set in Stone, talks about trying her hand at stone-carving, and Neill Cameron explains how he recreated (and then destroyed!) his old school, in order to write and draw the graphic novel Mo-Bot High. The Storyblog includes posts from debut authors and emerging illustrators alongside more familiar names, so watch out for some author legends such as Margo Lanagan and Philip Pullman! Last but not least I thought I'd share the movie trailer for One For the Money. I absolutely love Janet Evanovich's Stephanie Plum series, the books are just so funny and are great when you're looking for a light hearted but hilarious read. I realised a couple of weeks ago that I've not read any of the books since before I stared blogging so I re-read One For the Money last week and will be posting my review soon. Are you a Stephanie Plum fan? What do you think of the trailer? I have to say it looks like the film is going to stick fairly closely to the plot of the book. I'm not too sure about Morelli - he isn't at all how I pictured him but I'll reserve my judgement until I've seen the film. I think I'm going to like Stephanie though and I already love Grandma, Lula and Ranger (from what we've seen of them anyway!). I can't wait to go and see the film when it comes out over here in February! @ Debbie - I love the Stephanie Plum series, the books are really fun & light hearted reads. I can't remember what the US Divergent cover looks like & I'm not sure if I've seen the Insurgent one - I'm going to have to go and investigate now!